Manifolds of the INOXPA valves allow to centralize the functions of one or various tanks in a modular way, enhancing the efficiency of the system and control over the process. Manifold is an automated alternative to the flexible hoses and the flow divert panels with changeover bends. The automation of the operation results in safety, flexibility and it will pay off its cost very fast. One manifold applied to various lines allows cleaning of one tank while the other is being filled or emptied preventing any risk of product contamination. This solution has applications in the food-processing industry, for example, in production of dairy products, juices, in breweries, as well as in the wine production, and in the cosmetics and pharmaceutical industries. No manual operation is required. The operation is automated, preventing any risk of accidents. - It consists of a matrix of valves, their quantity depends on the elements to be connected (tanks or lines), and on the functions of each of these elements. The unit is mounted in modules on a skid with adjustable legs. - The Mixproof pneumatic valves (multi-way double seal valves) prevent any leakage from one body to the other. - The valves are balanced. 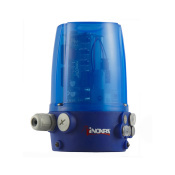 - Every valve is provided with a control box C-TOP with solenoid valves and sensors. - An air distribution collector is included and provided with the maintenance kit and a shut-off valve for each actuator. - The cleaning of the Mixproof valves is by Cavity Spray or Seat Lift systems. 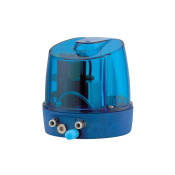 - If the Cavity Spray valves are selected, the kit also contains one collector of the cleaning distribution system for the CIP connection. This collector consists of a butterfly valve and a filter. - Under the manifold of valves and pipes there is a kind of inclined tray that collects drained products (due to leakage or cleaning process) from the manifold. - The unit is provided with a control panel, pneumatic and electric distribution system to facilitate the installation. 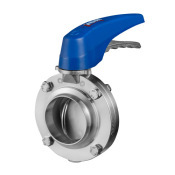 - Single seal multi-way valve. - Without C-TOP, solenoids are installed in the control panel and sensors on the pneumatic actuator. - Operator panel to display the states of the valves. - Connections: weld, Clamp, SMS, RJT, IDF, flanges.